Hello and welcome to Handmade Monday. If you're new here, check out this page. It's quick and simple and should bring you some new visitors! 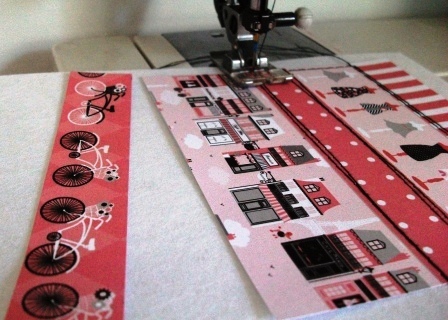 It's a good way of spreading the word about handmade and it's a lot of fun. This week has been a bit hectic for me. I've had two magazine deadlines looming as well as a whole load of website orders to paint. I have now finished (and clothed!) 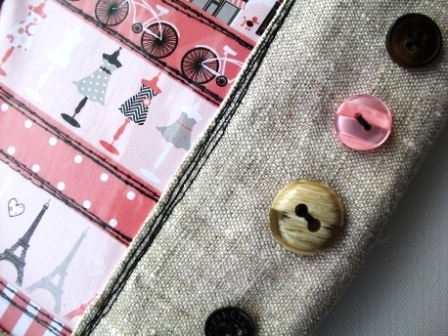 the rabbit for Sewing World. I was planning to photograph this rabbit in the arms of a small child but I didn't get that far, unfortunately, before the rabbit needed to be packed up...still, shouldn't be long before s/he makes the return journey (the rabbit, not the child). I'm hoping to sell this pattern eventually as a download - in the meantime, you can get the printed full-size pattern in the December issue of Sewing World magazine. A dress and dungarees are included in the pattern. Am I being over-sensitive in thinking this rabbit looked seriously alarmed at being encased in bubble wrap ready for enforced enclosure in a box for travel? How odd that fabric and stuffing that I've put together myself suddenly takes on a personality (even if it's only in my head!). 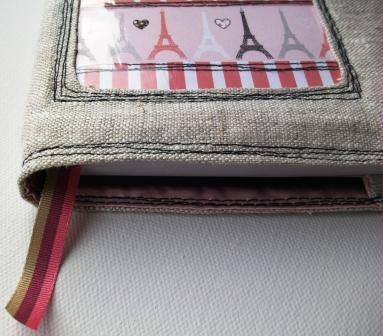 And I've also finished a diary cover for Craftseller. I had a little of the linen from Guthrie and Ghani left over from making the rabbit and decided it would be the perfect fabric for the diary cover. The papers I've incorporated (covered with clear PVC fabric for protection) are being given away free in an upcoming issue of Craftseller and I must say they are rather gorgeous. Paris in the springtime ... what a very lovely thought! 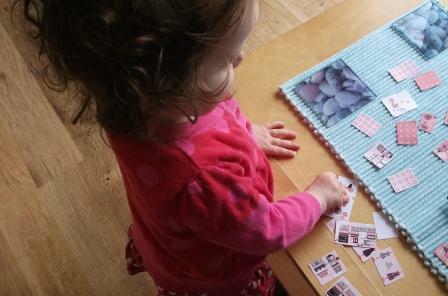 And while I was playing with the papers, a certain little someone enjoyed playing with the offcuts. I think she approved of them too - she certainly did a lot of sorting! It all looks so lovely. Can't wait to see a picture of the fully clothed bunny! What a lot of fabulous things. The bunny looks adorable. You've been so busy, I feel very tired reading about it! If it makes you feel any better, every time I sell a plushie I feel bad about popping them into jiffy bags. Always think they will get panicky. You must be having so much fun doing the work for those mags. I got all excited when I spotted some of your work the other day. I ran up to hubby and was all 'I join in Wendy's Handmade Monday, and her work is here - Sooooo coooool'. I think he thought I may need a call out from the guys in white coats, but as far as I am concerned, huge well done! Always nice to have an assistant. Sounds like you are having a great time with the work for the magainzes. Hope you have a gopod week. I love the little glimpse of the dungarees. The fabrics look really jolly. Can't wait to see the bunnies dressed up. Well done on completing your rabbit, I have to agree he does look like he has a personality I think it might be his eyes. Aww cheerio rabbit. I always think that they can't breathe when they are all covered in bubble wrap....how daft is that!! A bunny in dungarees just sounds too cute to be true! I like the diary cover. Such beautiful linen and pretty colours. Good luck with your magazine work. I totally know what you mean about that bunny taking on a personality. I have made a family of crochet toys that live in our home, and sometimes they break my little heart with their varying expressions. Glad to hear I'm not the only one that sees the personality of their creations! 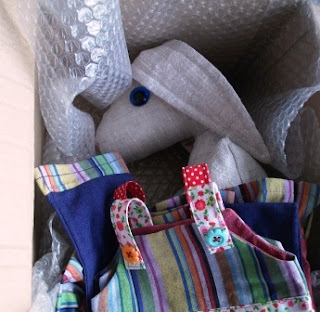 You finished, well done not sure bunny looks very happy in the box but he will arrive at his destination soon. Wow your so busy at the moment. Can't wait to see your bunny when he arrives home maybe he'll have an interesting tale to tell. Have a lovely week. I think your bunny looks like he has a personality, love the dungarees. Good luck with your commissions, the diary is lovely. Great to have a little helper! Hope that rabbit got to his destination OK?! Thanks for your lovely comments. The rabbit did arrive safely at the other end and I'm sure was unpacked and dressed carefully! I'm glad I'm not the only one who worries for the safety and feelings of inanimate objects. Highland Monkeys: yes, how can they breathe when they're swathed in bubblewrap?! I love the diary and will be looking out for a picture of the finished rabbit in his clothes.